Polly Homes did not live to see 25, but she is the 5G grandmother of our granddaughter. The sampler she stitched 193 years ago survives, a little faded in parts. I tell the stories of her five generations of non-living female descendants in the July 2017 New York Genealogical and Biographical Record. Cuddle up with a copy and see what you think. Samplers were a part of schooling at that time, and to some extent an insurance policy: wives marked their linens, and many a widow or grass widow plied the needle for a living. Books and surveys have been published based on samplers, some of which are beautiful and some of which document family trees. For more, check the informative and illustrated books by Betty Ring, Susan P. Schoelwer, and others. For now, I'm just happy to have these Holmes-Denison-Crandall-Burdick-Bassett female lines documented: just as much a family as those who share the same surname every generation. And thanks to NYGBR retiring editor Karen Jones for being willing to publish a "cross-grained" lineage. I can't wait to read this, Harold! 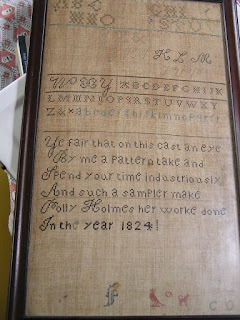 I'm a cross-stitcher myself and have made my own family history samplers, so I love reading the back story to heirloom works. Thank you.